TLC Boat Repairs has been established for 15 years, and is owned by Barry Lovell, an AM Dickies and Camper and Nicholsons trained boat repair specialist, with over 30 years experience. TLC Boat Repairs is the culmination of many years experience from some of North Wales leading boat repair specialists. Barry and his staff work as a team to provide everything you need to look after your boat or yacht. From repair and restoration, to engine servicing and repair, electronics, as well as a secure storage yard for your boat and trailer. Paul looks after the woodwork and Andrew looks after the GRP. All of the pictures on this website are photographs of our staff, facilities and work being carried out. TLC is based in the shadow of Conwy Mountain, annexed to the superbly equipped Conwy Marina. We are also able to service boats at other marinas in the area such as Deganwy Quay, Y Felinheli (Port Dinorwic) and Porth Penrhyn. Teak deck repair has also been done on yachts transported from Portsmouth, Plymouth, The Hamble and also from Scotland. Hoist facilities are available within Conwy and Port Dinorwic marinas. 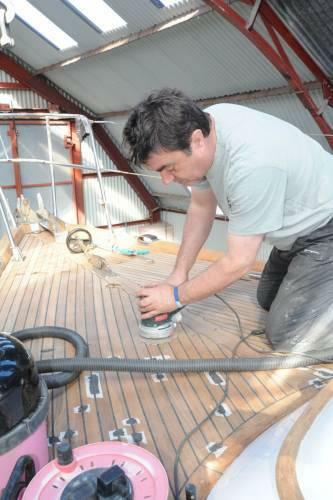 Being part of the Camper & Nicholson team fitting out the 58ft in the early 1980’s gave Barry a real benchmark against which to measure a high standard of joinery, a standard that TLC Boat Repairs still live up to. 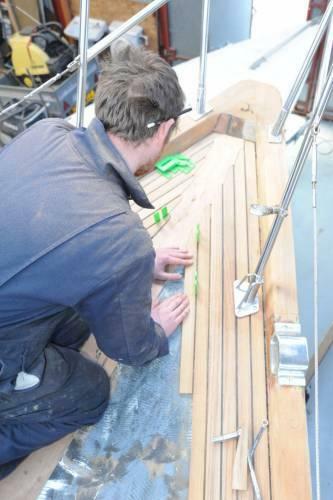 As well as custom teak decks we can also carry out internal alterations or alterations to a re-fit.